Low stakes MTTs are goldmine for our software. You don’t even need to deposit to start taking advantage of these. 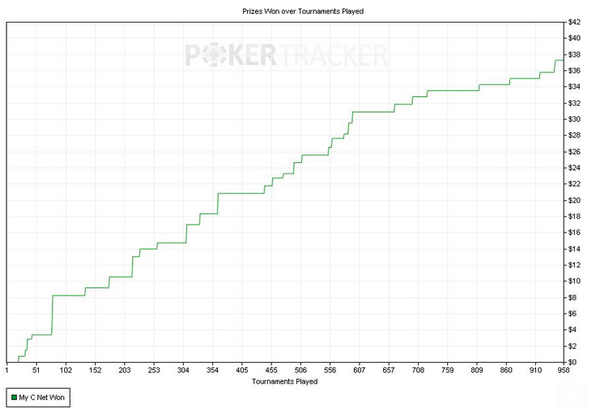 This graph is from a profile in our forum called Freeloader which is designed for, you guessed it, free-rolls. When you go from zero to about $40 like this, you can start playing $1 events and keep working your way up. We’ve had multiple stories from members over the years who have done exactly this, and eventually built a bankroll into the thousands without ever risking any of their own money. With multiple iPoker sites supported along with 888, Bodog, Ignition Casino, Americas Cardroom, and a handful others, you can find good action for your bot whether you live in Europe, the USA, Italy, France, Spain, Russia, Australia, South America, Asia, or just about anywhere else the virtual cards are being dealt. That’s it for now. If you need a license, there’s a link for purchasing one on the bot itself. Have fun at the tables and we’ll see you or your bot at the cashier window soon.